In between general conference sessions on Sunday, October 5, 2014 the Church broadcast perhaps the finest documentary ever made about the Book of Mormon. Written and directed by Russ Holt (How Rare a Possession: The Book of Mormon [the Vincenzo Di Francesca story], 1987; Special Witnesses of Christ, 2000; The Work and the Glory, 2004) and filmed by T.C. Christensen (Trail of Hope: The Story of the Mormon Trail, 1997; American Prophet: The Story of Joseph Smith, 1999; The Testaments: Of One Fold and One Shepherd, 2000; The Work and the Glory, 2004; Joseph Smith: Prophet of the Restoration, 2005; Emma Smith, My Story 2008; Forever Strong [the story of Larry Gelwix and the Highland High School Rugby Team], 2008; Gordon B. Hinckley: A Giant among Men, 2008; That Promised Day: The Coming Forth of the LDS Scriptures, 2010; 17 Miracles, 2011, Ephraim's Rescue, 2013), the work entitled "New Day for the Book of Mormon" documents the coming forth of the book, its impact around the world, and its increasingly favorable reception in the scholarly community. One comes away from this high quality production with the sense the Book of Mormon's star is definitely rising. You can watch it on BYU TV here. The piece begins with the quote: "All truths are easy to understand once they are discovered; the point is to discover them." Galileo Galilei (1564 - 1642). It ends with the quote: "Of all American religious books of the nineteenth century, it seems probable that the Book of Mormon was the most powerful. It reached only a small percentage of the people, but it affected this small percentage so powerfully and lastingly that all the people of the United States have been affected, especially by its contribution to opening up one of our great frontiers." Henry A. Wallace, Vice President of the United States, 1941 - 1945. In between it interlaces segments from 13 different interviews listed in order of first appearance in the film. Candid interviews on the streets of New York. This is the same way the Church's first movie in theatrical release, "Meet the Mormons," opens. Paul C. Gutjahr, Evangelical, Professor of English, American Studies and Religious Studies at Indiana University. Gutjahr is the author of The "Book of Mormon": A Biography published in 2012 by Princeton University Press in their Lives of Great Religious Books series. Stephen H. Webb, Catholic theologian. The blog article "Mormon Christianity" has notes from a lecture Webb gave at BYU in May, 2014. Amy Easton-Flake, LDS, Assistant Professor of Ancient Scripture at BYU. Lynn Ridenhour, Baptist minister from Missouri. Terryl L. Givens, LDS, Professor of Literature and Religion at the University of Richmond. Givens' By the Hand of Mormon: The American Scripture that Launched a New World Religion (New York City: Oxford University Press, 2002) was a milestone, a first-rate sympathetic treatment of the Book of Mormon published by a major academic press. Elder Jeffrey R. Holland, LDS, member of the Quorum of the Twelve Apostles. John W. Welch, LDS, founder of FARMS and Professor of Law, BYU. The people in our dispensation who have done the most to help us understand the Book of Mormon are 1) Joseph Smith Jr. who taught us to revere the text as an inspired document, 2) Hugh W. Nibley who taught us to read the text as an ancient document, 3) John W. [Jack] Welch who taught us to read the text as a Hebrew document, 4) John L. Sorenson who taught us to read the text as a Mesoamerican document, and 5) Royal Skousen who taught us to read the text as an Early Modern English translation document. Welch taught us that every word is important. Skousen taught us that every letter is important. Michael H. Mackay, LDS, historian with the Church History Department. Catherine M. Stokes, LDS, former Deputy Director of the Illinois Department of Health. Katty P. Dowdle, LDS, entrepreneur. Richard D. Rust, LDS, former Professor of Literature at the University of North Carolina. Orson Scott Card, LDS, novelist. Voice over historical re-enactments share words from Joseph Smith and Lucy Mack Smith. Givens in one of his interview segments refers to prominent LDS historian Richard L. Bushman and the interaction the two of them have had with Ann Taves, Professor of Religious Studies at UC Santa Barbara. The film presents 2 evidences for the authenticity of the text. John W. Welch recounts the well-known story of his discovery of chiasmus in the Book of Mormon on Wednesday, August 16, 1967 in Regensburg, Germany where he was serving as a missionary in the South German Mission under President Orville C. Gunther. This is not Welch's strongest retelling of the gripping account (on other occasions he has said the voice told him, "if it is evidence of Hebrew influence in the Gospel of Matthew, it is evidence of Hebrew influence in the Book of Mormon"), but it is effective and the background visuals are excellent. Chiasmus remains the strongest internal evidence we have from the text of its ancient origin. Welch explains that the literary form shows Hebraic circularity in thought processes as opposed to the more familiar Greek - Western linearity. Terryl L. Givens talks about the two stone altars in the vicinity of Naham in modern Yemen dating from ca. 600 B.C. that bear the inscription "to the people of Naham (or Nahum, Nahom, Nahem, Nehem. Ancient Semitic inscriptions lack vowels.) 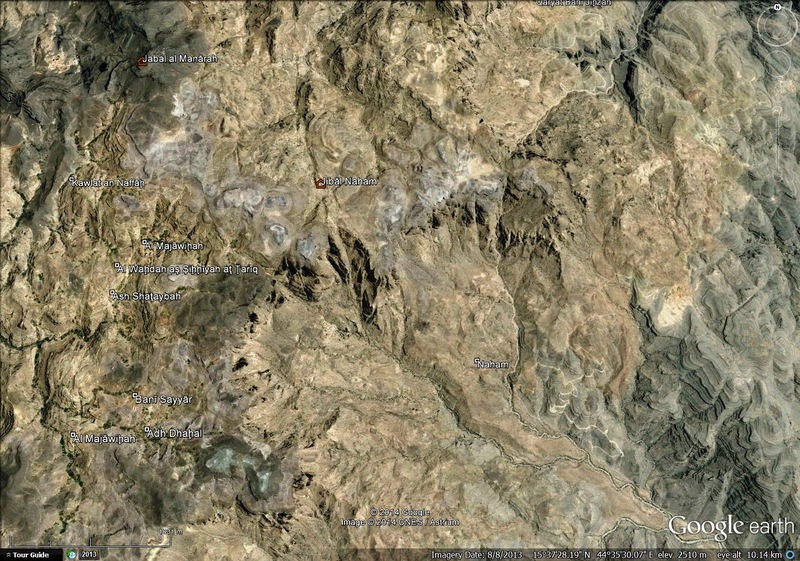 This is a Google Earth image of modern Naham showing the ridge line of Mount Naham towering to the north west. The Yemeni capital, Sana'a, is 52 air kilometers to the southwest. The blog article "Water Fight on the River - Round Ten" shows a photograph of one of the altars referencing Naham. It was Ross T. Christensen who first called our attention to this place in the August, 1978 Ensign comment "The Place Called Nahom." Christensen noticed the name on a 1763 Danish map. This is a clear and convincing example of a Book of Mormon place name successfully correlated with the modern map, corroborated by appropriately dated archaeological remains found in situ. The ancient Arabic term NHM connotes death or mourning as in 1 Nephi 16:34-35. Since 1830 the Book of Mormon has been maligned, scrutinized and revered by millions. Its very existence is more of a miracle than most people will ever realize (Welch). The book in infused with undeniable physicality and radical supernaturalism (Givens). Almost all of the text we have today was translated (dictated) in approximately 65 working days between April 7, 1829 and the end of June, 1829 (Welch). 20% of the original manuscript is extant (Welch). This is an error. Jack meant to say 28%. See Royal Skousen's preface to the Yale edition, page xxix. The Book of Mormon from the beginning has appealed to both the spiritual and the intellectual faculties of the believers (Givens). The book was first offered for public sale in Palmyra, NY on March 26, 1830. The first missionary in this dispensation, Samuel H. Smith, gave a copy of the book to Phineas H. Young in Mendon, NY about 23 kilometers from Palmyra, who in turn gave it to his younger brother, Brigham. There is more Jesus Christ in the Book of Mormon than there is in the Bible (Webb). Joseph Smith was a literary genius and also a theological genius (Webb). I have read the Book of Mormon through many times, to create timelines and a geography, to identify themes and cultural characteristics (Card). When you make it on the Penguin list, it says you are a major American author. It credentials the text (Gutjahr). I didn't get past the first page of 1 Nephi before I was as we say here in Missouri, sideswiped by God. I feel like I have been born again, again (Ridenhour). The Book of Mormon is more Baptist than the Baptist Hymnal (Ridenhour). There is no room in the narrative for allegorical or figurative meaning (Givens). The authors of the Book of Mormon wanted us to be better people, happier people (Card). The Book of Mormon has been subjected to a withering examination and it still stands. It will be a witness for Christ until he comes (Holland). Highly recommended. As they say in the movie business, five stars and two thumbs up.